320 pages + 16 pages of black and white illustrations. Paul Mason's ground-breaking biography of Maharishi Mahesh Yogi, previously available in hardback from Element Books, is now available once more, in a new and revised paperback edition from Evolution Publishing UK. The Maharishi Mahesh Yogi leapt to prominence in the 1960s when his teaching of Transcendental Meditation (TM) and his widely-reported involvement with The Beatles and the Beach Boys provoked reactions ranging from reverence to mockery. Now Paul Mason takes us behind the scenes, drawing on scarce and previously unpublished material. Much more than just a biography, this is a seminal enquiry into the aims and methods of Maharishi's organisations. We are taken deep into the Indian tradition of the Vedic scriptures, the Upanishads and the Bhagavad Gita. 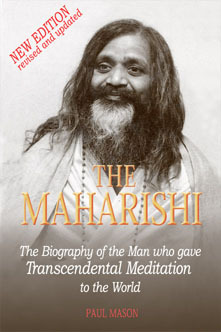 In this comprehensive biography Paul Mason describes the early days of Maharishi's teachings in the 1950s, the popularising of TM through the 1960's, the introduction of SCI (the presentation of TM in specifically scientific terms), to the attempts to enter mainstream politics with the Natural Law Party. 'Paul Mason's The Maharishi has satiated a more than 45 year thirst for an insight into Maharishi the man. The Maharishi behind the polished public presentation. Paul's insights and sometime humorous observations provide an extra layer to thoroughness and richness of Maharishi whose technique I learnt in 1975 and still practice now. "A rational look at TM. There are many books written by those in the TM movement that are biased with all kinds of claims, from unbelievable health benefits to flying! This book is a very balanced account of Transcendental Meditation." - Amazon.com reviewer, awarding it five stars. "An honest warts-and-all account of the Indian guru who brought TM to the West... Whether Maharishi is Deity Incarnate, a brilliant teacher now well past his prime, or a Hindu monk who was swayed by capitalism, Paul Mason's biography is well-written, well-researched and well-rounded." "Paul Mason, though he has practised TM himself, is no unquestioning worshipper." "There is a moral here about how attempts to build heaven on earth all too often end up looking like business opportunities. But the Maharishi always had a winning smile"
- Mick Brown, Daily Telegraph.